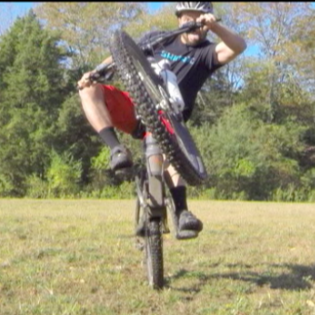 This video refers to a the “Pedal Wheelie” which is generally used when climbing. Usually the rider will be going rather slowly (climbing) and, thus, need to maintain or increase what little momentum they have in order to get over and beyond an obstacle. This wheelie is not to be confused with the manual or coaster wheelie (video here: http://www.dirtsmartmtb.com/uncategorized/video-manual-wheelie-coaster-wheelie/) which is generally used when going downhill when the rider has plenty of speed and momentum required to get over and beyond an obstacle, but because of the speed and momentum from descending, the front of the bike must be manipulated in order to not impact the obstacle at speed. EVERY rider that I have ever worked with has come away being able to do at least a small, yet functional pedal wheelie after instruction. Small wheelies are usually all it takes to be successful on the trail. Often, whats gets riders isn’t the lack of height of their wheelie, but the variables such as pedal strikes; spinning out because of a lack of weight shifts and/or a lack of understand of power distribution and timing (the old adage of always applying steady and consistent power on climbs isn’t going to work in tough technical climbs); staying seated when they need to get off the seat; lack of understanding of proper pedal cadence and gear selection (thus, an inability to accelerate the bike)…all kinds of good stuff! As always, this is in no way a substitute for real time instruction.